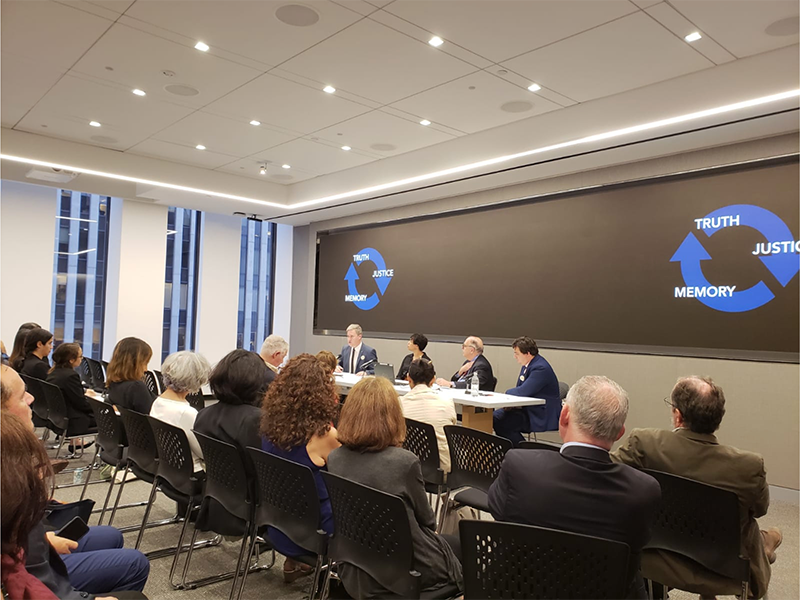 On Thursday, September 13, 2018, the Auschwitz Institute for Peace and Reconciliation (AIPR) held an informal and interactive panel discussion event at White & Case LLP in New York. Entitled “The Presence of the Past: How the U.S. Encounters Its Own History,” the event welcomed more than 50 friends and partners of the Auschwitz Institute and featured three expert panelists who considered a range of topics related to memory, memorialization, and human rights in the United States over the course of its history. A cocktail reception followed the discussion portion of the event, allowing attendees to talk with each other and with the invited experts about the concepts raised during the panel and the work of AIPR in preventing mass atrocities both within the U.S. and around the globe. The event began with the interactive discussion. 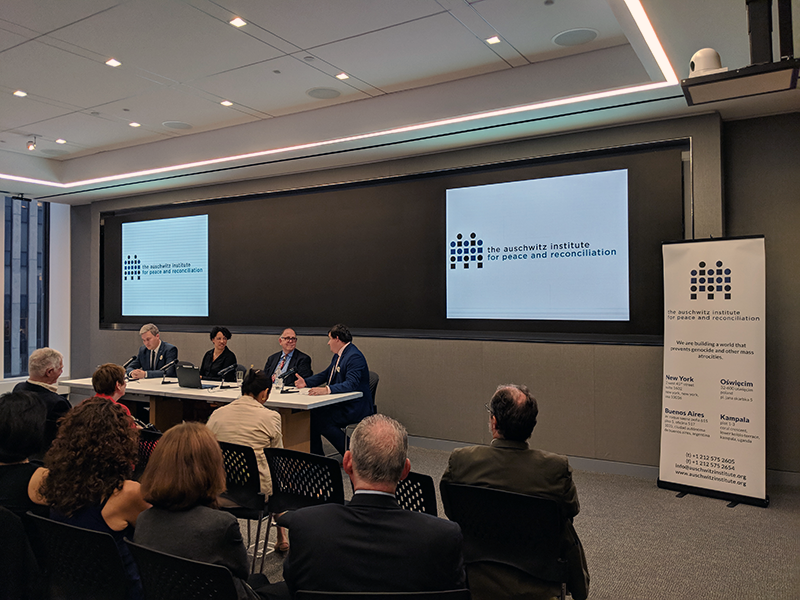 AIPR’s Executive Director Dr. Tibi Galis, who served as moderator, was joined on the panel by three experts in the realm of memorialization and transitional justice. Speaking first was AIPR’s Academic Programs Officer for Online Education Dr. Kerry Whigham, who is a Postdoctoral Research and Teaching Fellow at Binghamton University’s Institute for Genocide and Mass Atrocity Prevention (I-GMAP) as well as the Communications Officer and executive board member for the International Association of Genocide Scholars (IAGS). Dr. Whigham spoke about the concepts of memory and memorialization, focusing on the manner in which collective memory is created and how it has translated into various forms of memorialization in the United States. He also highlighted the complimentary nature of truth, justice, and memory and how they fit into efforts for transitional justice. Dina Bailey followed Dr. Whigham. She is the Director of Methodology and Practice for the International Coalition of Sites of Conscience and the CEO of Mountain Top Vision, a consultancy that focuses on organizational transformation in the non-profit and educational sectors. 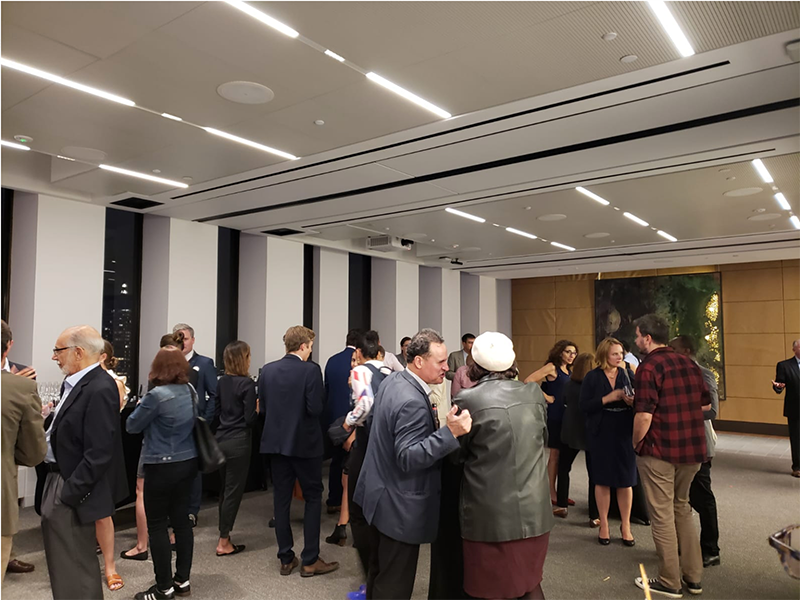 Building on the previous themes, Ms. Bailey introduced and contextualized the work of the International Coalition, which uses the power of place inherent in sites of memory to connect the past with the present in a way that enriches and empowers society. Equally, she introduced a series of memorial sites and ongoing projects in the United States that served as the basis for further discussion of the particular challenges that the field has had to confront in the U.S. context. John Haworth then shared his thoughts. 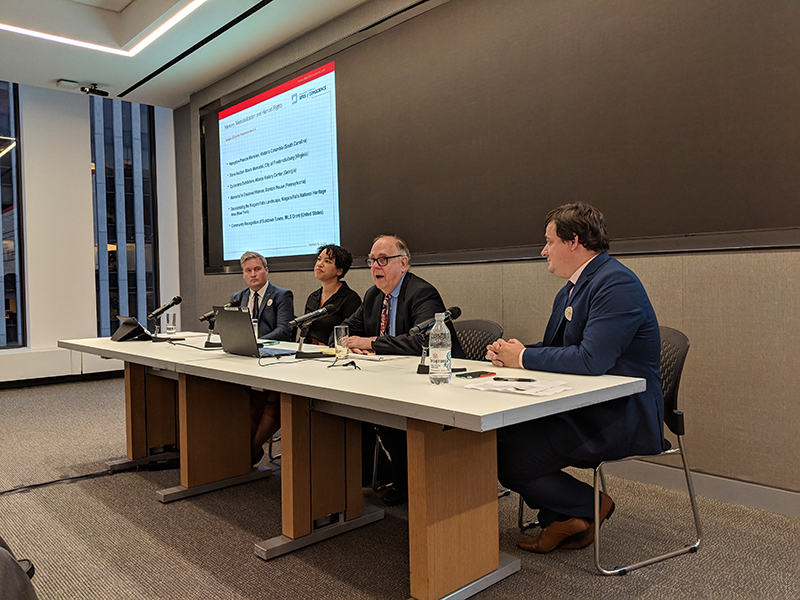 A member of AIPR’s International Advisory Board, Mr. Haworth recently retired after many years as the Senior Executive for the National Museum of the American Indian in New York City (NMAI-NY). Under his leadership, the NMAI-NY opened the major exhibition entitled “Infinity of Nations: Art and History in the Collections of the National Museum of the American Indian” in 2010, which he discussed as a case study in working towards decolonizing many of the traditional practices and attitudes held by museums and other institutions of memory in the United States. 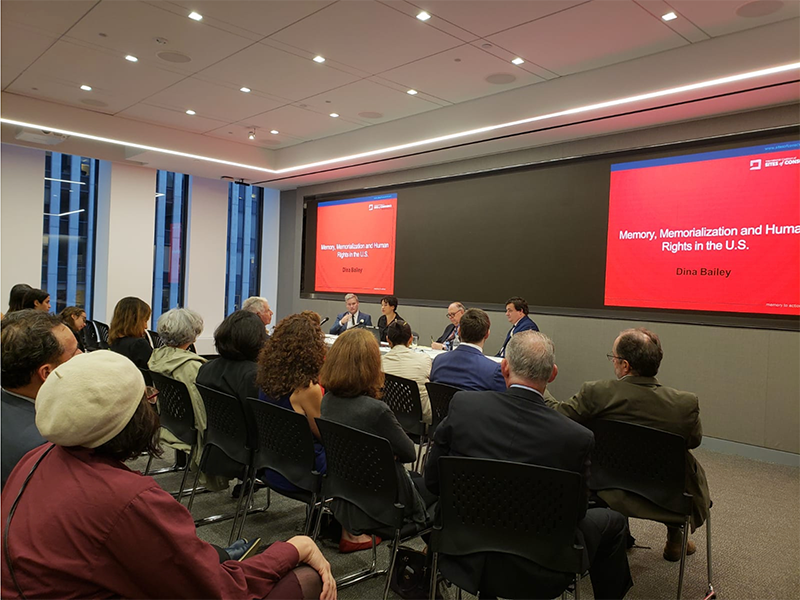 Mr. Haworth also talked about the importance of expanding work that invites critical assessments of existing narratives and examined differing conceptions of how societies treat monuments and other forms of memorialization that are no longer compatible with contemporary social and historical understandings. Following the segment devoted to remarks made by individual panelists, Dr. Galis raised broader questions about the way that collective memory has functioned in the United States as well as the role that exceptionalist narratives can play in constructing both the way that we understand history and the manner in which we approach current affairs. The floor was then opened to audience questions, which further expanded on several topics raised by the panelists. After several questions, the discussion was brought to a close and attendees were given the opportunity to mix, mingle, and chat with the invited panelists over cocktails.